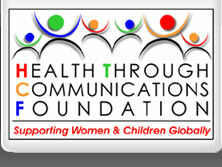 The goal of the Health Through Communications Foundation is to offer culturally sensitive art programs for children to prepare them for a creative and cooperative future with a high self-esteem, and a capacity for peace building by drawing upon their innate creativity and imagination. We believe that a child’s natural or even learned cognitive processes can influence development for the better, both in the short and long term. We also believe that positive experiences early on shape a young child’s personality in ways that remain stable throughout much of their life. Studies have shown that a child’s psychological growth and school performance can be enhanced by a focus on their artistic talent. Through the emphasis of imagination and creativity, future learning can be positively effected. The impact of this is wide reaching and provides personal and collective growth of each individual and the society it touches as a whole. 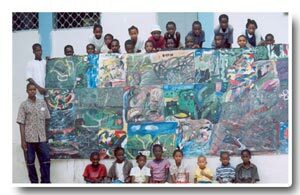 In the summer of 2001, a small arts program was started in La Vallee de Jacmel in one of the public schools built by CODEVA. Forty children were invited to create a mural to participate in a collaborative project called The Art Miles Mural Project©. Instead of forty, there were EIGHTY eager and shy village children who showed up, some of them having walked on empty stomachs miles from homes without electricity or running water. These children, ranging in age from 5 to 20 years old, with an average age of 13, had never seen television, had never held a paintbrush and had never done a collective project before! First, we fed all the children and people. 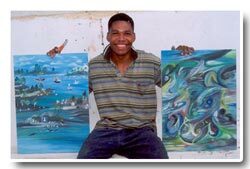 Then, after simple instructions, they not only produced a magnificent 12x5 foot mural on canvas with acrylics, they also made the most creative, colorful, individual paintings on bristol paper. People who have seen the effort of these children have been moved to tears. With great care and attention to detail, they painted what they see around them in daily life. 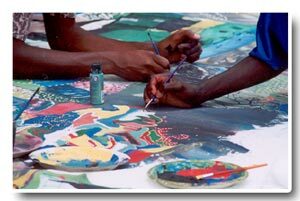 The results are astonishingly colorful, accurate depictions of their village lives from a truly local perspective. Many show real artistic talent for the first time. They are so proud! 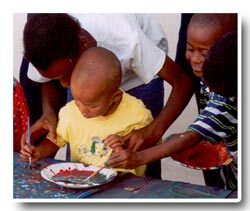 While learning how to express themselves and use their creativity, these young Haitian children also learned about discipline, sharing, and working together. This positive experience not only affected the children, but also spread to their families and throughout their villages. 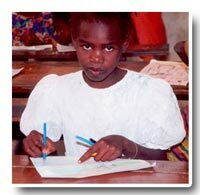 The impact of this initial enrichment project was so great on the children that they begged to be able to continue! With donations from the La Chappas and the Barona Band of Kumeyaay Nation, the first trade school in La Vallee was created starting with an art school comprising of two full-time art teachers. 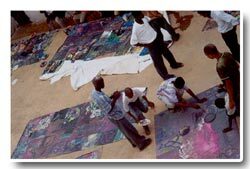 The result of these efforts are the creation of young artists who would never had a chance to express themselves and now have a way to earn a living. They are now earning a living teaching children in our newly opened kindergarten. Art Programs In The U.S.
First, the art program started in El Cajon, California in the summer of 2003 at EJE - Excelencia y Justicia en Education– Excellence and Justice in Education. The dream is to have these kinds of programs in many areas of the world.